Slum communities in the Global South often lack public space, but quite a few organizations have launched creative initiatives around the world to create, reclaim, restore, and amplify public space. Read on to see successful examples from Nairobi, Lagos, Mumbai, Jakarta, and Mexico City, and join us on URB.im to learn more. In Nairobi, community-based organization Urban Mirror incorporates participatory methodologies as tools in the struggle to reclaim urban public space. 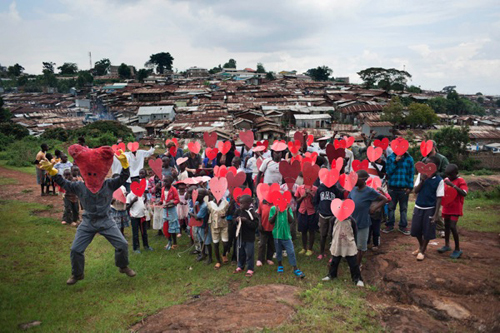 One of their initiatives is the creation of a public space icon and superhero known as Upendo Hero, "a defender of public space, a lover of Nairobi, a sworn enemy of gentrification and a soldier against the privatization of public space." By demonstrating in Kibera, Nairobi's largest slum, Upendo Hero supported Kiberans in their struggle for public space and communicated to the government that it should give space back to the community. Although it's hard to quantify lasting results of this initiative, Upendo Hero is clearly a much-loved and recognizable figure throughout the city and its slums, thus raising awareness to a problem often overlooked. The Jakarta-based Volume Factory is a team of students, professors, and designers who focus on the interdisciplinary areas of architecture, urban planning, art, design, technology, education, and sustainability. The group works to put on a variety of activities that encourage citizens to think about how public places can be made more attractive through architectural elements, graphics, and ornamentation in order to make the city's space better serve the general public. The team organizes a yearly event called "Park(ing) Day," where members present their ideas about public space; this year's event was called "Reclaim your City: Building and Celebrating Public Space". 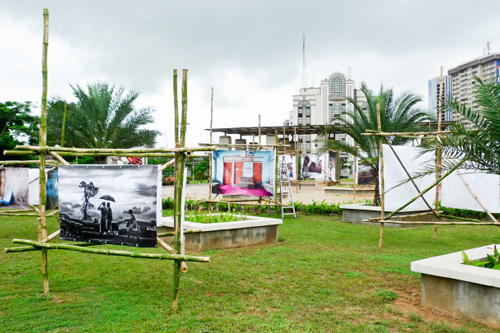 The LagosPhoto Festival, an annual month-long photography festival of exhibitions and artist workshops, is one of the major artistic festivals on the African continent. The Festival is especially innovative because of its emphasis on community and public accessibility: in a time and space where artistic appreciation is often a privilege that few can afford, the festival centers on bringing contemporary art -- in this case, photography -- to the public in central community spaces. This goal, along with portraying Africa realistically and not sensationally, is central to the organizers' aims, which is to "reclaim public spaces and engage the general public with multifaceted stories of Africa." The Mexico City government has been working to rescue public space to make room for sports, thereby promoting physical activity and community bonds, and reducing the risk of youth violence, crime, and addiction. It opened 32 basketball courts in partnership with NBA stars, hoping to inspire young people. In partnership with Telmex, Mexico's largest cellphone carrier, the government organized a public, amateur soccer tournament. This project not only helped restore thousands of public spaces for inclusive and environment-friendly use, but has also fostered teamwork, discipline, and honesty among the young competitors. The tournament was even recognized in the Guinness Book of World Record for having the highest number of participants in a tournament. "Vision Juhu" is a public interest project working to comprehensively enhance the state of Mumbai's public spaces. The goal is to conserve reserved open spaces and create new ones, pedestrianize certain areas where a large amount of foot traffic competes with cars, open up new access areas to the beach, include zoning for street vendors, and increase access to social amenities and services. Citizens are working with the architects to develop the plans for their neighborhoods collaboratively, which is crucial for developing Mumbai as a world-class city for all its residents, not just a wealthy minority. Whether with the help of a superhero, a photo festival, better urban planning and communication, or through a basketball tournament, these initiatives show how the urban poor in the Global South can reclaim the public space that belongs to them. Share other successful strategies and join us on URB.im to discuss.